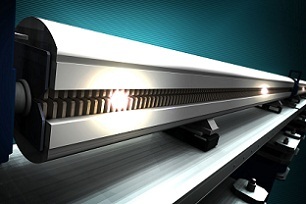 What can you do with the world’s most powerful X-ray laser? Researchers at the US Department of Energy’s SLAC National Accelerator Laboratory hope it can help them create improved energy sources, better drugs and new applications in environmental sciences and material engineering. 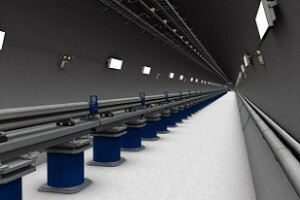 The image at left shows a rendering of the LCLS (for Linac Coherent Light Source) Undulator Hall, which houses a long array of high-precision undulator magnets where the X-ray beams are produced. 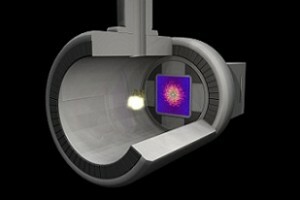 which can produce pulse of X-rays more than a billion times brighter than the most powerful existing sources. The ultrafast X-ray pulses act much like flashes from a high-speed strobe light, letting scientists take stop-motion pictures of atoms and molecules in motion. south magnetic poles, which cause the electron beam to undulate along its trajectory, creating X-rays. A total of 33 LCLS undulator magnets like the one pictured at the left will create intense X-ray laser light from a pulse of electrons traveling near the speed of light. lutionary new materials with unprecedented combinations of properties for a host of applications in energy, transportation, information technology, medicine and other fields. The American Recovery and Reinvestment Act provided $53.6 million to speed up construction of scientific instruments for the LCLS, as well as to develop an a new instrument. 20 million project funded by the Department of Energy with construction led by SLAC National Accelerator Laboratory in partnership with Argonne National Laboratory and Lawrence Livermore National Laboratory. 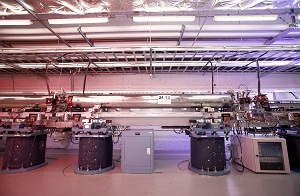 Other national laboratories and universities provided significant support and components of the machine during the development of the LCLS. To the left is an artist’s conception of a device that could take holographic images of single molecules. 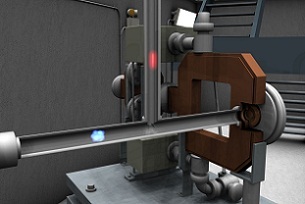 The X-rays pass through the molecule and leave a distinctive pattern of rings and spots on the surface of the detector at the back of the chamber.